Beat blackouts and declare your home’s energy independence with sonnen Protect in the form of the sonnenBatterie Protect 2500! Manufactured by Germany’s multi-award winning sonnen, this small device is an add-on component for sonnenBatterie Eco systems. It can sense electricity outages and blackouts in real time and automatically switch to your stored battery power. This enables you to have an off-grid emergency electricity supply! 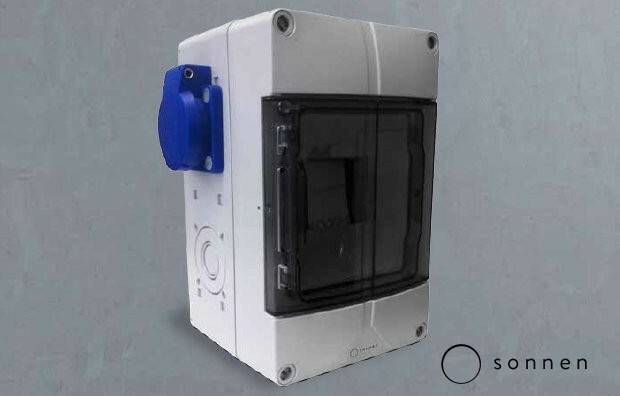 With sonnenBatterie and Sonnen Protect 2500, you can prevent spoilage of valuable food items, have continued lighting and maintain the operation of small appliances (see below for more details). To learn more about this amazing device, call our friendly experts on 133-SUN today or register your interest via our retrofit request form. If you’re wanting a full solar power system featuring a sonnen battery and the Protect device, you can also submit for a quick quote here. We offer a number of configuration choices when buying a sonnen battery system if you wish to also incorporate backup power protection. Energy Matters’ battery system experts can help you select best energy storage solution and options for your particular needs and circumstances. If you already have a sonnen battery system installed, we can retrofit a tailored Sonnen Protect 2500solution. Install just the sonnenProtect, which has a single power point. Use extension cords and plug boards to power appliances. Run new cables from the sonnenProtect, to defined backup power points, via exposed conduit. Location of electricity outlets according your preference (e.g. one behind fridge, behind microwave, one in living room). Each power point is limited to 2.5 kW load (sum of all points also limited to 2.5 kW). Run new cables from the sonnenProtect installed neatly inside your walls to defined power points. Location of powerpoints will be according to customer preference. Each power point is limited to 2.5 kW load (load sum of all points also limited to 2.5 kW). Call our storage experts on 133-SUN to learn more about these options. For an obligation-free retrofit quote; use this form. For a full solar + Sonnen solution, you can also submit for a quick solar quote. Call us on 133-SUN to learn more about the potential backup power capabilities. Alternatively, for a no-obligation retrofit quote; use this form. For a full solar + sonnen solution, submit for a quick solar quote. Note: When operating in off-grid mode with sonnen Protect, the sonnenBatterie cannot be charged by a solar panel array.